All the products in this post are from At Home (with the exception of the table runner which was just a piece of burlap I bought at JoAnn Fabrics). This isn’t a sponsored post, but I did collaborate with them on an Instagram post and wanted to share more of the photos here because I was so happy with how it all turned out. Also my Instagram post with At Home includes a giveaway that ends tonight, so if you want to hop over and enter, now’s the time to do it! Our last kitchen table was a hideous 80s orange-oak piece from Goodwill. 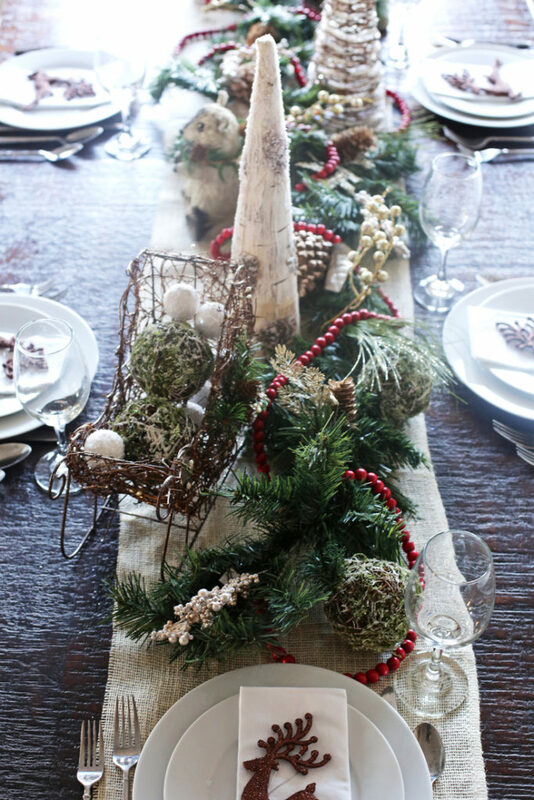 I started getting into decorating our table for holidays or special occasions because I wanted to hide as much of that table as possible. 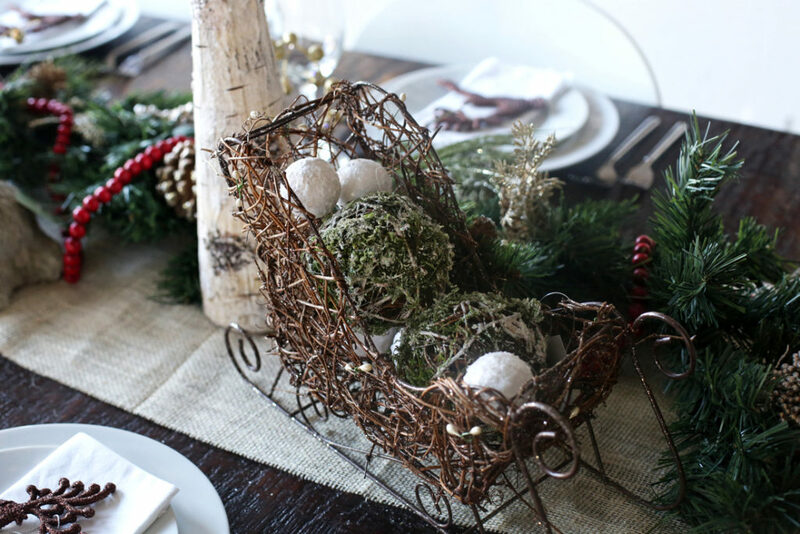 When we upgraded to a much nicer table last year, setting a holiday tablescape became way more fun because I had such a much better base to work with. 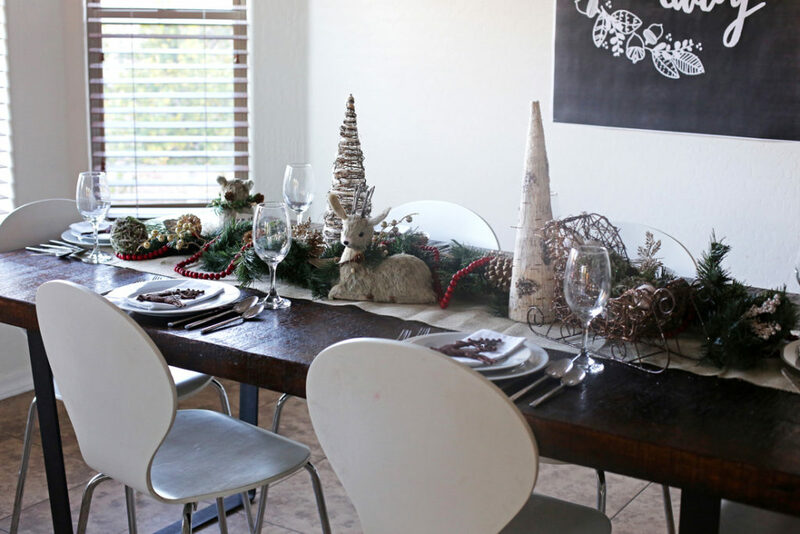 Now having put together a bunch of different tablescapes for various holidays, I’ve learned a few tricks to make them come together easily and make them look great. 1. Pick a small color scheme. Especially if you’re doing a tablescape that’s fairly busy, I think you want to keep the variety of colors pretty small. For this Christmas one, I went with greenery, wood tones and gold, and then added in the red cranberry beading for a little pop of contrast. For our Halloween tablescape, I went orange, black and white, with a little purple. Picking a small color palette also makes it easier to pick things out that all go together when you’re shopping. 2. Vary the heights. I put together a basic Thanksgiving tablescape a few weeks ago and everything was the same height. I couldn’t figure out why it looked so bland until I pulled out a few bigger items that I’d overlooked in my holiday closet and the variety of heights made a HUGE difference in it looking finished and polished. 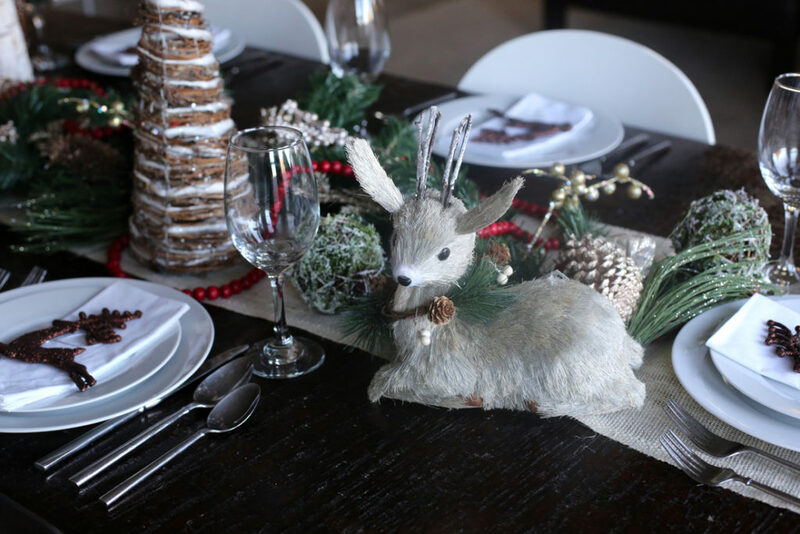 When I was picking out the items for this Christmas tablescape, I was purposefully on the look-out for a few taller items so it wasn’t all just two inches tall. 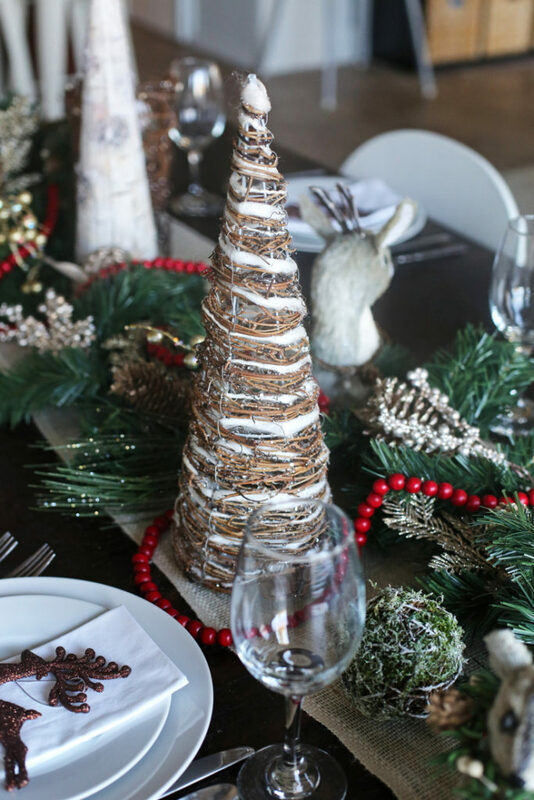 These simple wooden trees were perfect for giving it some dimension, and then the sleigh and animals were a nice in-between height. 3. Pick a few fun items. 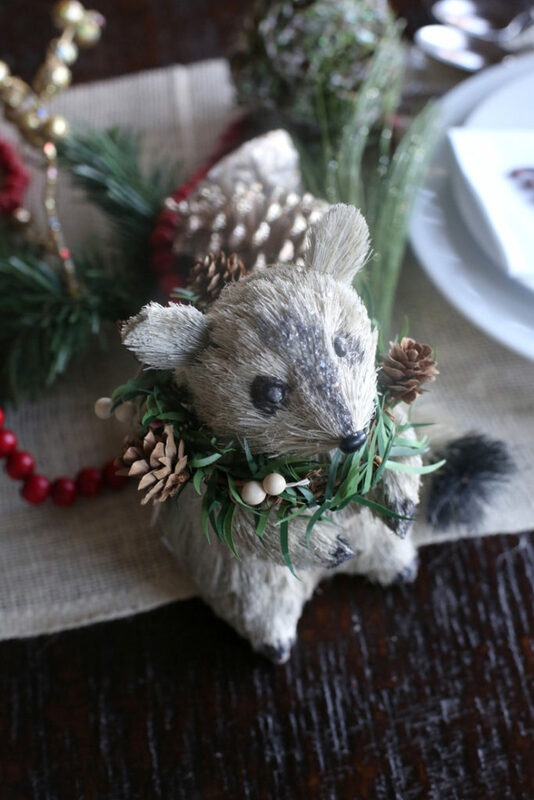 When I spied these little woodland animals on the shelf at At Home, I knew they’d be the perfect thing to make it a little more whimsical, without breaking my color scheme or standing out too much. I love that they act as a fun little surprise that you might not expect on the table. 4. Mix up the textures. Just like the food you’re serving, you want the textures to be pretty varied, especially if the colors are all quite similar. I loved that the pine boughs, the furry animals, the wooden trees and sleigh, the smooth red beading, and the glittery berries. I feel like it gives it a nice full texture without looking crazy busy. 5. 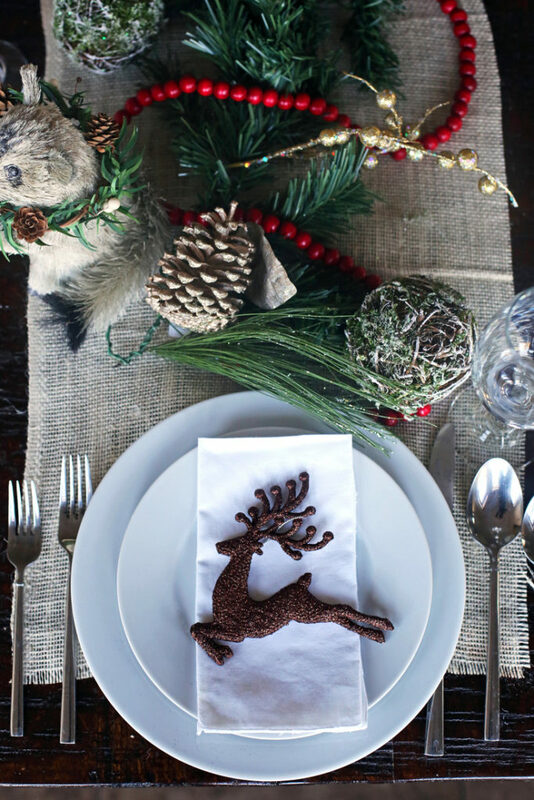 Decorate your place settings. 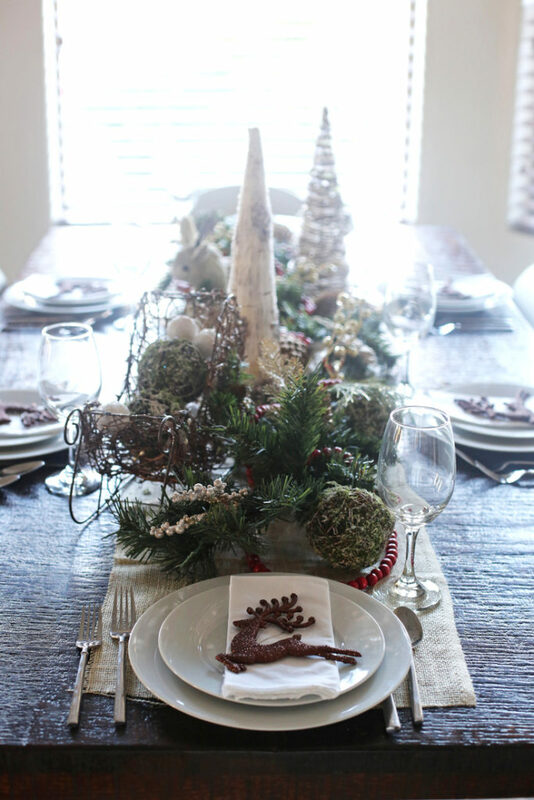 It’s too bad to have a gorgeous tablescape down the center and then plain place settings. 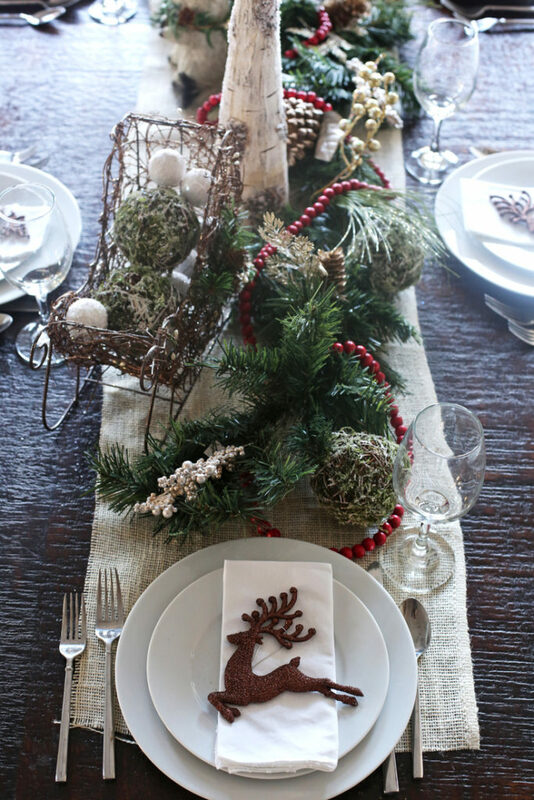 I like to extend the theme onto the plates, whether with napkins or napkin rings, a place card or something else fun. 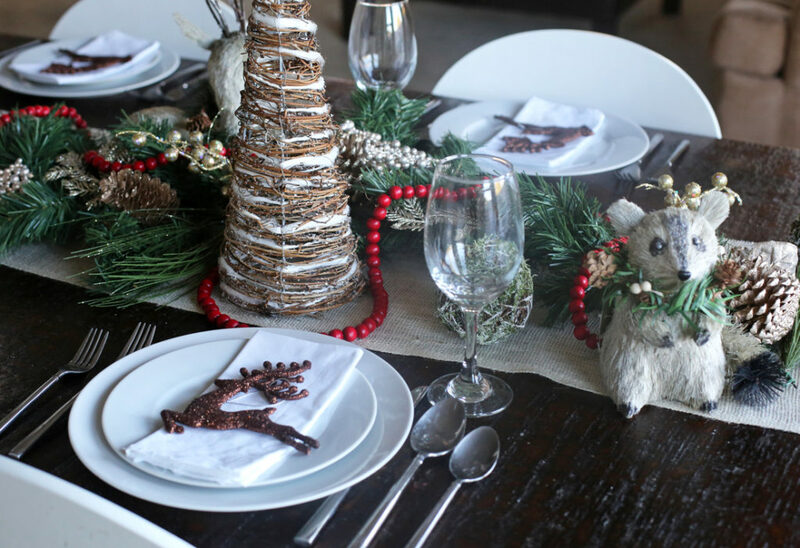 I grabbed these sparkly wood-looking deer ornaments for a few dollars at At Home and they were perfect for putting on top of the plates and napkins to pull in the color scheme and feel of the rest of the table. 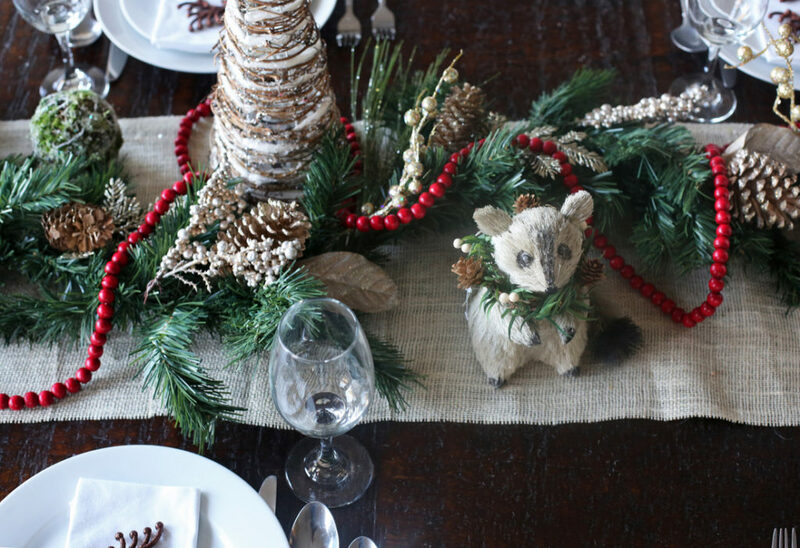 Do you have any secrets for decorating your table? I’d love to hear them! 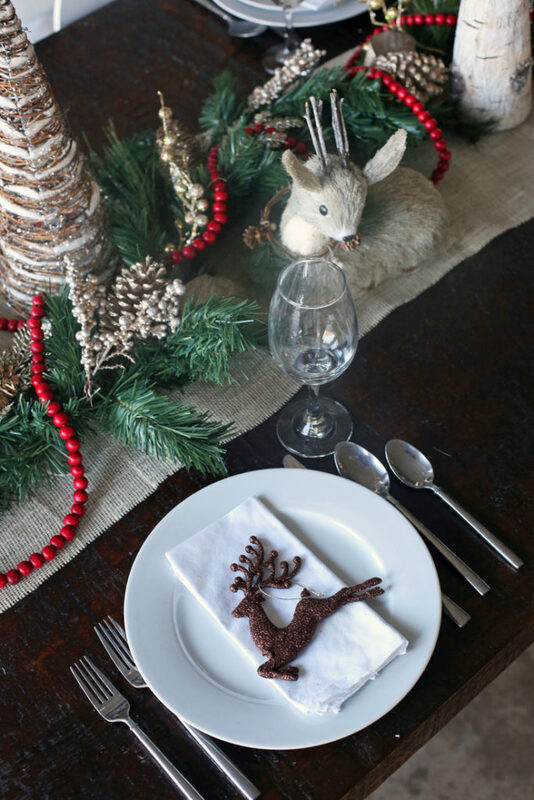 I’m also hoping to make a set of festive Christmas napkins this year – we’ll see if I get around to it. 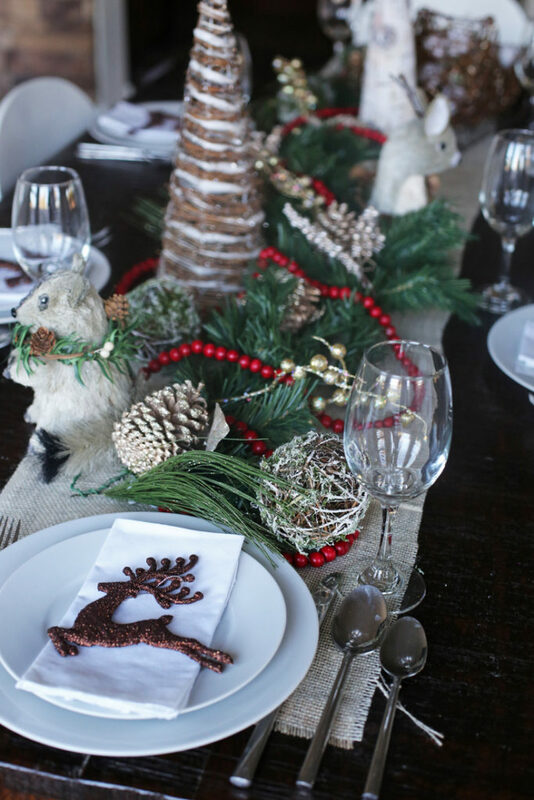 wow – I'm not familiar with tablescapes and yours looks amazing. so do you leave that up all Christmas season or just for one day? I don't know that it would last even one day in my house but maybe I could do something similar on the shelves. I usually do a simpler version for the whole season and then fill it out for the big holiday meal. 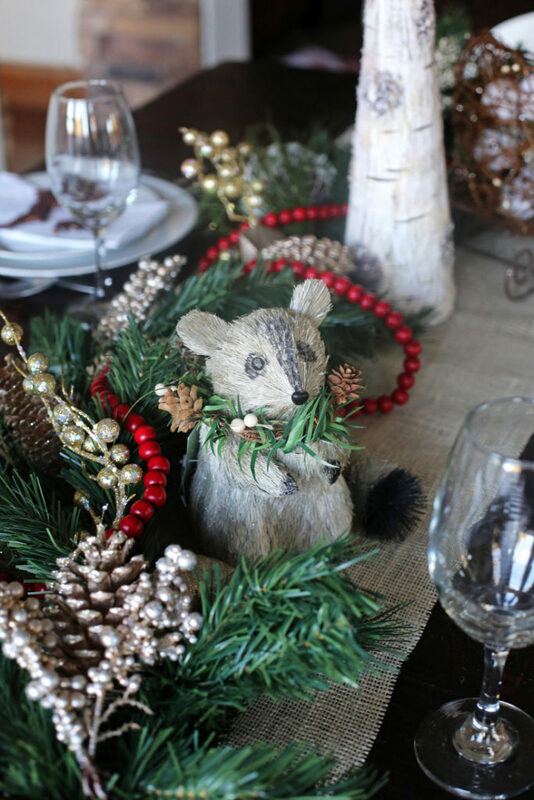 I love those little woodland animals and the reindeer ornaments! They are perfect. Talk about gorgeous! Love the different heights. 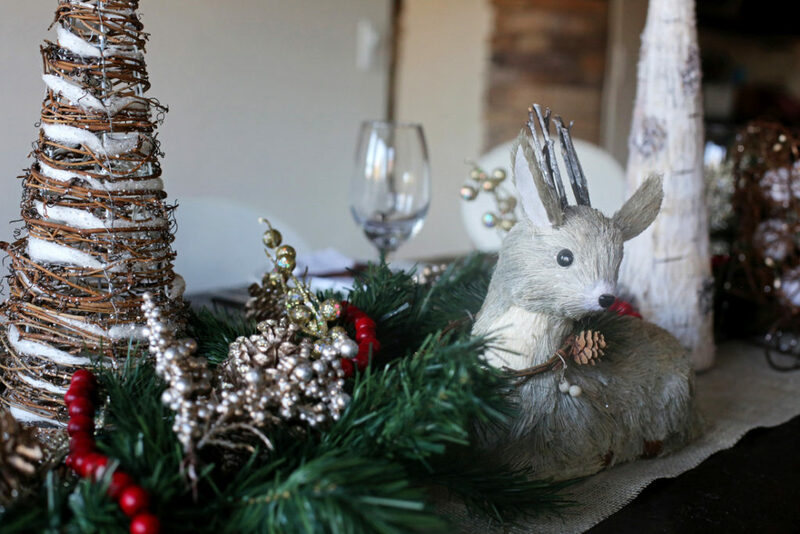 You always have the best holiday tables! Love what you did for this one!